The “Spedale per i Pazzi” of Fregionaia (a place outside Lucca, in the outskirts of Maggiano) was founded by the Republic of Lucca in the second half of the eighteenth century. In 1769 the Senate of the Republic of Lucca put forward a request to the Pope Clemente XIV (Lorenzo Ganganelli) to obtain the suppression of the Monastery of the Lateran Canons of Santa Maria of Fregionaia. The following year it was then established to assign the structure to the admission and the care of mental patients. On 20th of April 1773, with the settlement of the personnel, the “Spedale de' Pazzi” of Fregionaia was officially opened, depending from the “Spedale cittadino di San Luca della Misericordia”, and the day after the first eleven patients arrived from “Carcere cittadino della Torre” (the prison of the Tower). From the beginning of the 1820’s, thanks to Giovanni Buonaccorsi, the manual occupation was used as rehabilitation therapy. During the nineteenth century the requests for admission to the Hospital increased. 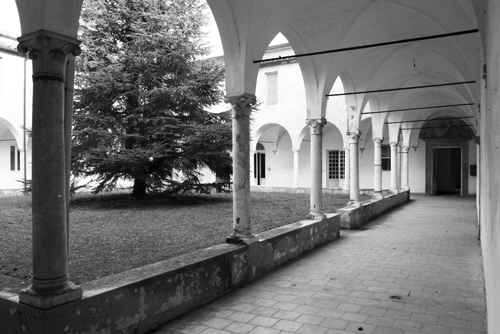 In 1913 the Mental Hospital of Fregionaia passed under the administration of the Provincia di Lucca until the sanitary reform in 1978, when it entered the USL until its definitive close in 1999. At the promulgation of the law 180 in 1978, the “Spedale” resulted the most ancient Mental Hospital in Italy.